It’s hard to imagine a more complete depiction of a relationship than the one that Danny Braverman unearthed in a dusty shoebox five years ago. Laid down over almost 60 years, the 2,500 or so images were the work of Braverman’s great uncle Ab Solomons, a shoemaker who started scribbling pictures for his wife, Celie, on the back of his weekly wage packets in 1926. 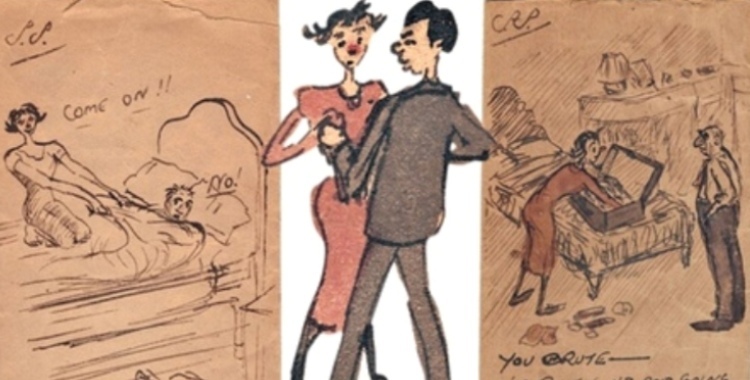 Beginning in London’s East End, where Ab worked and lived, the drawings trace the evolution of a marriage, as flirtation gives way to bickering and domestic contentment is ruptured by painful events. There are bedroom scenes where Ab jokes about his snoring; and others where the quarreling couple are locked in stalemate. One is annotated with the telling words, “I can be as obstinate as you can.” We see the growth of Ab and Celie’s two sons, and the growing spectre of illness. Celie is a constant presence, pictured forever as she was when the pair married. The outsider emerges as a recurrent theme of Ab’s art and of the show. As the son of Jewish immigrants, Ab was something of a marginal figure himself, with antisemitism casting a shadow over several of his drawings. In a Britain where immigration is once more the subject of fierce public debate, this is where the show’s subtle but insistent politics is located. There is also, I suggest, a modern resonance to Ab’s compulsive sharing. What he depicted in art, we now publish on social media. In the same way that Ab’s drawings give equal space to death and trivia, as many Twitter posts are devoted to the serious as to the silly. “It’s very different,” counters Philippou. “What you do in a tweet is you spend 10 seconds doing it; what you do with a work of art is you make it. You don’t make a tweet.” What has been lost, Philippou and Braverman suggest, is craft and care. “It does make you wonder about that mode of communicating – where is it now?” asks Braverman.